You are about to embark on your first practicum. You’re probably excited; this is the beginning of your chosen career after all. You’re probably a little nervous; unsure of what to expect. Your associate teacher (aka. mentor teacher) is excited for your arrival too; we learn a lot from watching you teach and your sharing of new ideas. We’re also a little nervous about your arrival; we’re about to hand over our wonderful students and our carefully cultivated classroom to you for one month. That scares us a little bit. So I wanted to give you some advice from some very seasoned teachers that have also had their share of student teachers. Personally, I have now mentored 5 student teachers during my 9 years of teaching. I have done so in 4 different subject areas, in 2 different provinces, with student teachers from both the regular B.Ed. program and the concurrent education program. I have had student teachers who were classroom ready & I recommended that they be hired to any principal who would listen. But most student teachers are not naturals. Most of you will need to work really hard at becoming a decent teacher. Some of you are not meant to become teachers at all and will either be removed from your practicum by your associate teacher and university supervisor, or will simply bow out of the profession within the next few years. This might seem harsh, but it is the truth. Another truth: Teaching jobs in this area (Ottawa, ON) are hard to come by these days and regulation 274 has made it even harder. So you have to be an awesome teacher. You have to network. And you have to be OK with the fact that it might take you 5 to 10 YEARS to get beyond working as a substitute teacher. Your goal is to learn as much as you can from the students, teachers, and school while you’re in your practicum. Here is, what I hope is, some helpful advice to lead you towards a successful, smooth student-teaching experience. Once the university tells you which school and associate teacher (hereafter referred to as AT) you’ve been assigned to, send an email to your AT introducing yourself. Long enough to tell them a little bit about who you are and any teaching experience you have. Not so long it becomes a self-indulgent biography; we’re busy people and don’t have time to read long-winded emails. It’s also a good idea to phone your AT and leave a quick voicemail (we’re rarely by a phone during the workday) introducing yourself and mentioning that you sent them an email as well. Some teachers still prefer phone calls while other teachers hardly ever check their voicemail box but answer email religiously; this way you’ll have covered both bases. Ask your AT if they have time to meet with you during lunch hour or after school some day before practicum begins. You can make this request in your original email to your AT. If you have the time in your class schedule, you may wish to offer that you could spend time volunteering in your ATs classroom before practicum starts. This is a great way to get to know the school, your AT, and the students before officially starting your practicum. – Course names & codes that AT teaches. How much of this your AT is willing to do before practicum starts will vary. Some ATs will want you to show up on day 1 of practicum and will start working with you only then. Other ATs (myself included) would be very happy for you to start working with my students as a classroom volunteer before practicum starts. If your AT is not amenable to you visiting ahead of time, don’t take it personally; they might just be too busy at the moment. Visit your teacher in their classroom! WEEK 1 OF PRACTICUM: First impressions matter! Here is where the school visit suggested in #2 comes in very handy; what do the full-time teachers and principals at the school wear to work? A good rule of thumb is to always dress a notch above what the majority of staff are wearing; just like you would in an interview. You don’t want to overdress by a long shot because you’ll stand out. You also don’t necessarily want to take your cue to wear jeans everyday just because the full-time teachers are relaxed enough in their teaching positions to do so. Dress professionally. For men: nice slacks (dress pants, khakis, etc), button up collared shirt and tie. For women, dress pants or a nice knee-length skirt with a nice top or sweater. Nothing too short or low cut; nothing skin tight (NO leggings unless covered by a skirt or dress); no crazy jewellery; simple shoes; subtle makeup; hair nicely groomed. If you do wear jeans on a Friday (I wouldn’t any other day as a student teacher), make sure they are dark wash jeans and pair them with a top that is on the dressier side. While the public tends to think of teaching as a cushy 9-3 job, the reality of the teaching day is much different. Most teachers arrive at school anywhere from a half hour to two hours before the first bell rings. We often work through lunch; tutoring kids, coaching sports, supervising clubs, etc. And then we often stay late for extra help, sports games, planning for the next day, and so on. Find out what time your AT arrives each day & arrive at the same time. Stay until they do at the end of the day. While on practicum you are expected to engage as a teacher would, which goes far beyond 9-3! As you walk around the school over the first few days greet everyone with a smile. And that means everyone; students, teachers, janitors, office administrators, … everyone! The people that you might think matter least in the building usually have a much bigger impact on your reputation than you realize. Introduce yourself to people; and write down their names as you go so that you won’t forget. Be a positive, upbeat energy in the school; it will not go unnoticed! I know you’re keen to get in & get your hands dirty teaching, but this time of observation is so key for you so please make the most of it. I wish I had time in my teaching day to observe the skill of my fellow teachers in their classrooms; I could learn so much! Observe not only your AT, but other teachers in the school as well. Ask your AT to suggest some teachers with different styles, or trying innovative things in their classroom that you might observe during your first week. And not only in your subject area, as a math teacher I can learn a lot from watching English teachers do their thing! Take notes. Take more notes. Then ask questions. A big part of becoming a great teacher is developing the ability to reflect on your practice. A good start is by reflecting on the practice of other experienced teachers. a) classroom routines and rules; what are they and how are they used to make the classroom run smoothly? b) lesson breakdown & timing; what are the “parts” of today’s lesson or activity, how much time is devoted to each part? c) teacher actions; how does the teacher get the class settled & start, how do they transition b/w activities, how do they interact with students, how do they deal with behaviour problems, how do they answer questions, what sorts of questions do they ask their students, how do they wrap up the class, how do they use non-verbal communication to get what they want from students, etc. d) questions; what do you want to clarify with the teacher, why did they do what they did?, how come they answered that student the way they did? NOTE: Be careful in how you approach this discussion with your AT or other teachers. You, by nature of being a student-teacher, don’t know everything yet. Your questions should come across as genuinely curious, and not accusatory. You might think you know a better way, but trust that the teachers you’re observing know more about their individual students than you do and they have a wealth of teacher experience upon which they draw. In addition, you also need to observe what your AT is doing before school, during their prep period, during lunch, and after school. What duties are assigned to them? How & when do they plan lessons? What other responsibilities does your AT have around the school? Teaching extends far beyond the actual classroom and so you must participate in all of these duties and activities with your AT. Your week of observation is a bit of a “fly on the wall” experience. You should not be piping up with thoughts and ideas while your AT delivers a lesson. At no time should you ever challenge your AT in public about information they’ve stated or an action they’ve undertaken (you may wish to make a note and ask them about it with an open mind later in private). However, with your ATs permission & hopefully encouragement, you should be interacting with students during individual and group work time. Learn the students’ names (a class list w/ photos is very helpful here). Offer your AT help with administrative items such as taking attendance (also good for learning names) and photocopying. You are here in your practicum to learn! Learn through thoughtful and reflective observation of expert teachers. THE REST OF PRACTICUM: Your turn! Depending on your program the expectations of how much teaching you do will vary. ATs will also have their own ideas of how much teaching you should be doing. My advice to you: go with their flow. If they ask you to take on more than you’re ready for, or earlier than you’re able to, speak up with your concerns. But, in general, you should happily take on whichever classes and however much workload they offer you. You can use all of the classroom time you can get! Plus next year, if you’re lucky enough to land a full time position or LTO, you’ll have a full workload of courses that won’t necessarily be of your choosing. As your AT, we’ll be here to coach you through the hard work. Side note: your personal life, while important to keep in balance, will necessarily take a bit of a back seat during your teaching practicum. Be ready for long nights of lesson planning, lesson editing, and test marking. Yes, this will probably get in the way of hanging out with your friends or spending quality time with your family. Welcome to a career in teaching! Use a month-at-a-glance calendar to plan each course that you’ll be teaching – which topics on which days? Print up copies of the curriculum documents for your courses; you should be using them all the time as you plan your lessons. Ask whether you need to make your own original lessons or does the AT want to offer you their past material that you can use & adapt? Share your long-range plan for the month with your AT so that they may help you adjust it as needed to fit into their long-range plan for the full year. Do not plan chalkNtalk lessons where you talk for 75 minutes and the students listen and/or take notes. Think of interesting ways to engage your students in the material and have them think critically about it. I usually suggest breaking each period into 15-20 minute “chunks” or activities; beyond 20 minutes many students get bored and off-task. Submit your lesson plans 2-3 days ahead to of time to your AT so that they can look it over, offer feedback & you can adjust them before implementing. Take your ATs criticism seriously and adjust your lessons or activities accordingly. Try all technology AHEAD of time (does your powerpoint file work on school computers, is that website accessible on school internet, how do you use a graphing calculator?) so as not to be surprised when it doesn’t work in front of the kids. Know your stuff; if you’re not sure about a topic then read up about it, practice it, ask your AT for help. The students will eat you alive if you stand up in front of them for 75 minutes without knowing the topic inside and out. You do not need to mimic your AT. In fact that strategy will probably backfire spectacularly. You need to be yourself, let your personality shine through, show that you care about the students and their learning. That said, by now you will have observed countless other teachers and you can experiment with different strategies you’ve seen to test which work the best for you in the classroom. You are not here to be the students’ best friend. They have their peers for that. What they need from you is a strong, reliable caring adult that will be a positive influence on them, but not let them get away with murder. I know you want them to like you. I promise they will if you develop a strong, effective teaching style. They will not like you if you let them get away with misbehaviour and walk all over you. Develop a solid approach to behaviour management. It is my experience that teacher colleges rarely spend enough time teaching and discussing behaviour management strategies with teacher candidates. So take it upon yourself to start discussions amongst your peers on the issue, to google “behaviour management” and read a variety of teacher blogs on the topic, to ask an experienced teacher or AT to host a lunchtime workshop on the topic. Getting a handle on dealing with student misbehaviours will make your practicum run that much smoother. You don’t know everything. None of us ever do; learning is a life-long process. Approach your practicum with a growth mindset and be open to learning to become a better teacher; that’s why you’re here! Ask your AT for written and oral feedback daily. What went well, what could be improved? Take time at the end of each day to write down some thoughts about what went well and ways to improve each lesson or activity. It is only through focused and intentional reflection that you can begin to improve your teaching practice. Engage in discussions with your peers. You can help each other reflect on and improve your teaching as well. I would also strongly encourage you to start developing your online personal learning network (PLN) via Twitter. There is a global community of connected educators on Twitter sharing their thoughts, experiences, and research with you. This will encourage you to become more reflective of your teaching and is a great way to network as well. Start by following the Twitter account of the school you’re in and any connected teachers there. Near the end of your practicum ask your students to reflect on your teaching as well. I often suggest having them fill out a sheet with the prompts “Something Ms. Wheeler did well is _____ ” and “Something Ms. Wheeler could do even better next time is _____”. The first one gives you some quotes that can be cut out and put together as a collage in your teaching portfolio (useful for job interviews). The second one gives you honest feedback on things to improve from the students’ perspective. I’ve mentioned before how teaching goes beyond 9-3 and the classroom walls. Your school has a plethora of clubs, sports, and extra-curricular activities happening at any given moment. Take the time to learn a little bit about them all. Choose one or two activities that peak your interest and offer your help coaching, supervising or simply ask to tag along so that you can learn more about it. This will serve as a great way to meet students beyond those that you teach, to really get a feel for the school culture, and of course looks great on a résumé down the line. Get involved in extra-curriculars at your school! PRACTICUM IS OVER: What now? Saying thank-you is important because the final impression you make is just as important, if not more so, as that first impression. Have a thank-you card written up to present to your AT on the last day of practicum. Many student teachers will have a gift for their AT as well in recognition of the time and support they’ve dedicated to you over the last month. A thank-you card to the admin team (principal & VPs) as well the office administrators is always welcome too. Now is the time to ask your AT for a letter of recommendation that you can keep in your portfolio. Ask them also if you may use them as a reference when applying for jobs in the future. If you have had a positive practicum experience this should not be a problem. If your practicum was not so successful your AT may decline, in which case it’s not a recommendation that would have helped you anyway. I know you’re headed back to classes at the university now. I know you have assignments to do. But consider coming back to our school when you’re not in your own classes! Offer to continue volunteering in your AT’s classroom. Volunteer in other classrooms with other teachers. Come back to help coach a sport or run a club. Your student-teaching practicum is a time to watch expert teachers, learn as much as you can, try new things, experiment with your teaching style, and network for the future job search. It’ll be tough and tiring but hopefully also very rewarding! Welcome to the teaching profession! 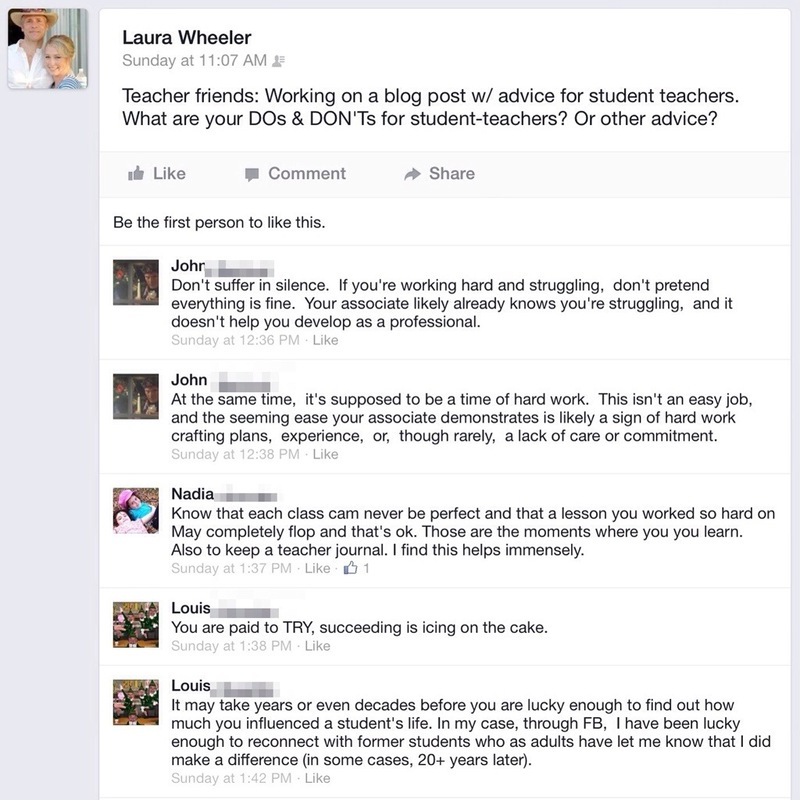 Do you have any DOs and DON’Ts for student-teachers? Let me know in the comments below! @wheeler_laura This post by @approx_normal has a number of items. approximatelynormalstats.blogspot.ca/search/label/s… There's one for the mentors too. @wheeler_laura It's impt to identify what's going well in lessons, even if it's small. Focusing on weaknesses only can affect morale.